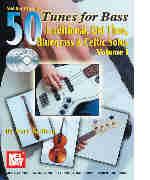 50 Tunes Volume 1 for Bass is one book in a 5-book series. The 50 Tunes series is a collection of Bluegrass, Old Time and Celtic tunes for ensembles, families and individuals. This book contains the same 50 tunes as those found in the other 4 books of the series, but carefully designed for the bass. The parts in this book range from beginner to advanced and are arranged in "basic," "active" and "solo" levels. Basic, a standard accompaniment mode is the simplest level of bass playing. Active bass is a mixture of basic accompaniment and "walking" which is common in jazz music. Solo bass--which involves fast, syncopated melodic phrases--is the most complex level of bass playing. All parts are written in standard bass clef notation and 4-line bass tablature. Companion CD's included.